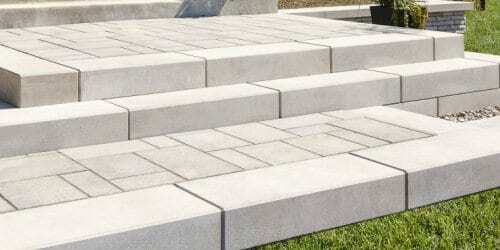 New for 2016, Techo-Bloc strive to always be a step ahead in design and technology. 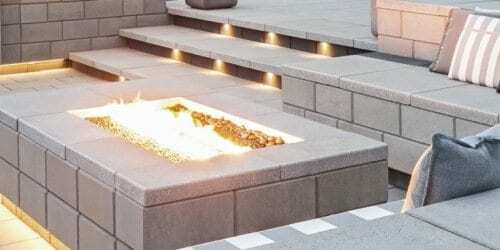 Natural beauty reproduced in our own modern concrete products to offer you beauty that is precise, color tones that are stable and pieces that are dimensionally consistent for superior installation. STRENGTH & DURABILITY STARTS AT THE CORE. Fine granite aggregates create superior density compared to the subgrade course limestone used in competing products. Results in a finished product with much higher density, lower absorption and incredible structural integrity for quality that lasts a lifetime. Freeze & thaw results that break records. We test our products using saline tests rather than water tests. 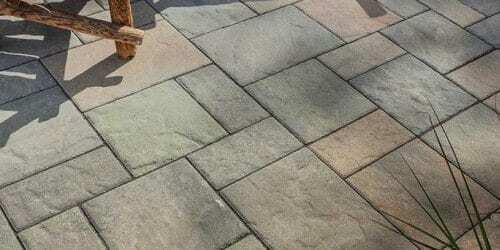 Techo-bloc dry-cast paving stones are de-icing salt resistant and engineered to withstand the harshest climates. You can hear the echo of the craftsman’s tools in Blu. Blu 60mm is a great choice for pedestrian and light-traffic-only areas such as on walkways and patios. 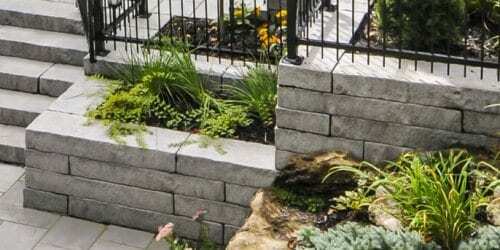 Inspired by the use of railroad ties in both traditional and modern landscape design, the Borealis wall/edge’s versatility extends from simple edging for flowerbeds all the way to the creation of double-sided walls and garden walls. A defined yet simple design, the Brandon wall is the perfect addition for your yard. Comes in 90 and 180 millimetre. 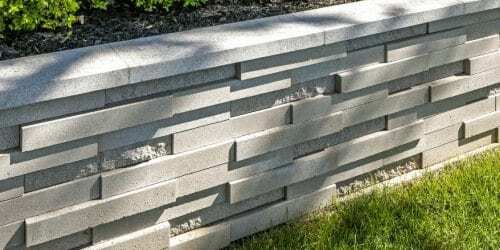 This eye-catching ultra-modern double-sided retaining wall. The Graphix wall’s varying depths and unique but simple installation process creates a 3 dimensional visual effect. The sleek, polished look of the Raffinato collection brings modern elegance to your tailored spaces. 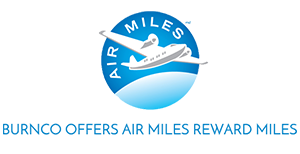 The 90mm high and 180mm high versions are packaged separately. 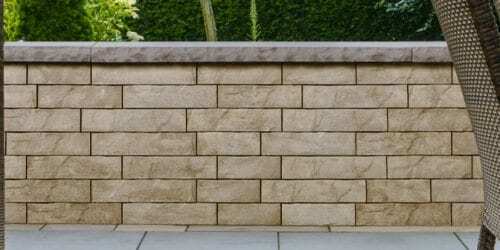 The Röcka wall/edge is a carved-stone with incredibly natural features. 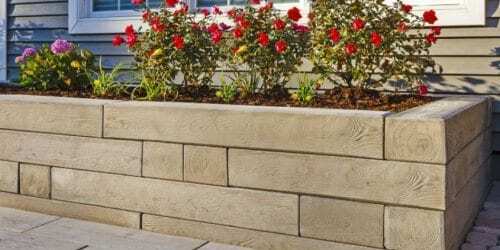 Its impressive versatility lends itself to applications such as a double-sided garden walls and edging for flowerbeds. 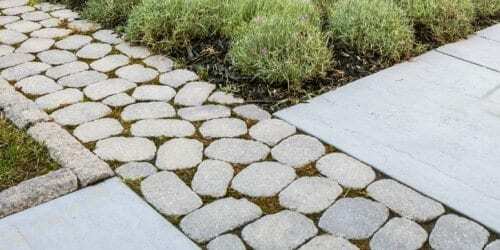 A simple yet stylish paver with high versatility of application. Available in smooth and polished finishes. 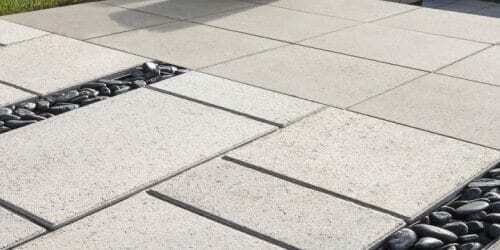 The EVA paver’s petite dimensions and beautifully sculpted finish brings a fresh perspective to traditional paving stones. 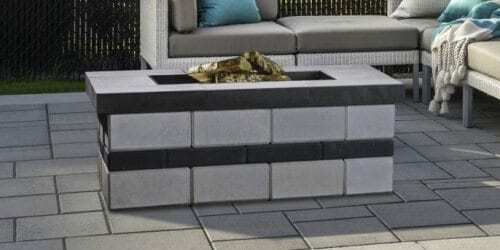 Its proportions allow for a number of interlocking patterns great for driveways, walkways, poolsides and patios. 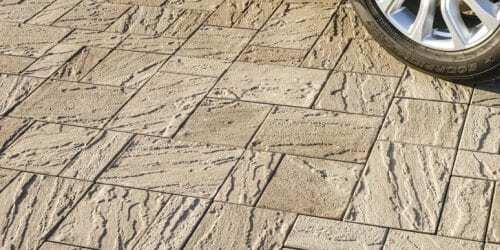 Antika pavers are like snowflakes: no two are exactly alike. This product has seen incredible popularity with the recent custom mosaic and banding design trends. The sleek, polished look of the Raffinato wall has now been extended to a step application. The Raffinato step is a more elegant and refined alternative to modern and very linear concrete steps. 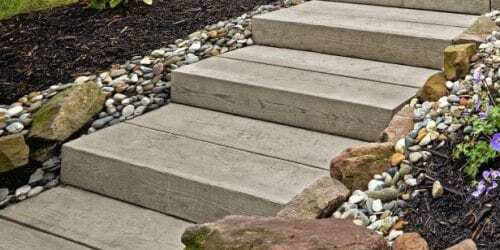 Inspired by the use of railroad ties in both traditional and modern landscape design, the Borealis step was designed for compatibility with the Borealis wall. The step is designed to look like 2 large trimmed logs stuck together. The sleek, polished look of the Raffinato collection has now been extended to outdoor features. The Raffinato fire pit kit is a pre-packaged (not pre-assembled) kit that can accommodate wood burning, natural gas or propane-fueled fires.